The countdown on the Fix It Now MN website is at 38 days, 6 hours, 44 minutes, and ticking until GAMC (General Assistance Medical Care) ends. Providing health care coverage for the poorest of the poor in Minnesota, GAMC was eliminated by Governor Pawlenty via a line item veto at the end of the last legislative session. Over 33 years ago, the Minnesota State Legislature created GAMC to avoid shifting the costs of medical care for the poorest Minnesotans to those who have health coverage. On March 1, 2010, over 35,000 Minnesotans will lose their basic health safety net. These individuals, on average, make less than $8,000 annually and most earn less than $2,700 each year. The loss of GAMC is a health care coverage issue, a public safety issue, a social justice issue, as well as an economic issue. Currently, Minnesota hospitals and clinics provide $462 million in uncompensated care. Hennepin County Medical Center and Regions Hospital are the only hospitals obligated by state law to provide care for the poorest Minnesotans, regardless of whether they are reimbursed for that care. Unless legislators act quickly in the coming weeks, these hospitals will be forced to raise the $380 million needed through alternative means. Without another program or funding stream, hospitals face two options: Pass the cost on to other health care consumers or eliminate vital medical services that we all benefit from, including burn treatment centers and Level I adult and pediatric trauma centers. 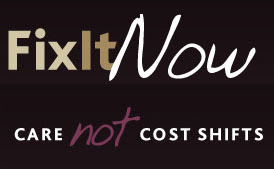 To learn more about GAMC and to urge your legislators to ensure health coverage for the poorest of the poor in Minnesota, visit Fix It Now MN or the Save GAMC coalition. Act fast - there's only 38 days, 6 hours, 43 minutes, 26 seconds until GAMC is eliminated. CNN and other major news outlets depict the trauma, weariness, and angst of Haitians and relief workers currently toiling round the clock to bury the dead, heal the wounded, and rebuild the island nation following the catastrophic earthquake one week ago. To give people a glimpse into the beautiful landscape and culture that existed before all that the general public knew and saw of Haiti was pain and suffering, I want to share a few images my camera captured during my brief time in Haiti. Next Monday, schools, banks, and post offices will be closed in observance of Dr. Martin Luther King, Jr. Day. However, the National Corporation for Community Service urges people to consider it a "day on," not a "day off," in hopes of honoring the legacy of Dr. King, Jr by continuing to fulfill his commitment to beloved community. Dr. King, Jr made the struggle for equality and social justice his life's work, teaching that through nonviolence and service to one another, the greatest of societal injustices and evils can be overcome. Even today, this belief can inspire us to take on the mounting challenges that our state and nation face, economically, socially, and politically. To volunteer in your local community next week, Serve.gov has organized listings of opportunities nationwide and other resources, including a feature to create and/or register new service projects. Check out the MLK Mobilization Hot Spot, the MLK Day 2010 Day of Service, and the Corporation for National and Community Service's Service Connection. 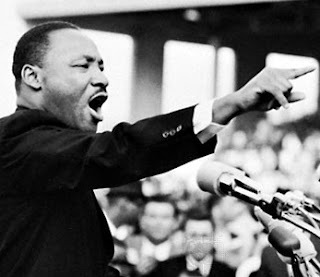 Whether you serve your community next Monday, the next day, or everyday, your service is an affirmation of Dr. Martin Luther King, Jr's conviction that, "The time is always right to do what is right." 6 years ago, last week, I stood in this building. As of Tuesday evening, it is no longer standing. 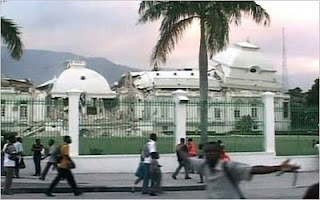 Haiti's capital city, Port au Prince, suffered a 7.0 magnitude earthquake on Tuesday evening, just before 5:00PM EST. Over thirteen additional aftershocks, many registering at 5.0 on the Richter scale, followed. Buildings more than one story tall, already dilapidated as a result of Haiti's poor infrastructure, shook to their cores and collapsed. Over 100,000 are estimated dead and many more are wounded or trapped, with little hope for adequate medical attention or rescue. The National Penitentiary collapsed, allowing inmates to escape, and prompting worries about looting by escapees. Simply put, there's no electricity, there's no water, and Haiti is a state of emergency and chaos. While disaster relief organizations and rescue workers take to the triage effort over the next few days, the best things for rest of us to do are to donate money for relief, to learn more about Haiti's compelling history, and to consider opportunities for not only restoring, but improving the quality of life for those living in the poorest country in the Western Hemisphere. * Text 'HAITI' to 90999 to donate $10 for Red Cross relief in Haiti. * Donate to Partners in Health/Zanmi Lasante, which has long worked on the island with the philosophy that health is a human right. "As a result of this calamity, Partners in Health probably just became the largest health care provider still standing in all Haiti." * On 1 January 1804, Haiti became a free republic. 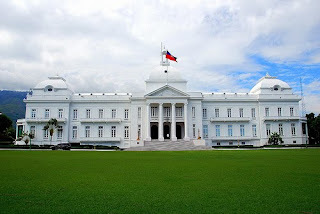 Haiti was the first independent nation in Latin America, the first post-colonial independent black-led nation in the world, and the only nation whose independence was gained as part of a successful slave rebellion. * The Haitian Revolution stood as a model for achieving emancipation for slaves in the United States who attempted to mimic Toussaint L'Ouverture's actions. 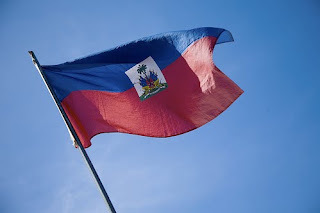 * In 2004, Haiti celebrated the bicentennial of its independence from France. * The US has suspended deportation of Haitians but US Senator Kristen Gillibrand (D-NY) and TransAfrica Forum issue a further call to place into effect Temporary Protected Status. * Jubilee USA has called for the cancellation of the remainder of Haiti's international debt. 60% of Haiti's debt was cancelled under the World Bank and International Monetary Fund's Heavily Indebted Poor Countries (HIPC) initiative in June 2009. However, that correcting this injustice took so long, when a substantial portion of the nation's debt had clearly accrued under the despotic administration of the Duvaliers, is little cause to celebrate. The annual debt service payments amounted to 35% of Haitian GDP and short-changed its citizens of the ability to invest in infrastructure, health, education, and more. It is worth asking how much more Tuesday's earthquake was exacerbated by Haiti's odious and illegitimate debt. * Call your US Senators and Representatives to urge their support for President Obama's call for a "swift, coordinated, and aggressive response," to the crisis in Haiti. Massive assistance for relief and reconstruction should come in the form of grants, not loans. Search Congress.org's online directory or call the U.S. Capitol Switchboard at (202)224-3121 and ask for your senators' and/or representative's office. Tonight, a number of colleagues and fellow activists with whom I'd visited Haiti in January 2004, following its Bicentennial Celebration, reconnected over the phone. We caught up with each other, shared personal news and media reports about the current conditions in Port au Prince, but most importantly, reflected on the memories of our days shared together on the island. That time, spent amongst Haitians concerned about the survival and development of their nation, was what truly made us love Haiti and to care to this day for its health. I'm posting an old news article highlighting my brief time in Haiti and a short documentary video I made a few short months after, following the forced-removal of democratically-elected President Jean Bertrand Aristide from power and from the country. Kite Ayiti Viv! Bullets were flying nearby at a violent protest when 19-year-old Diane Tran and 12 other American students arrived at the U.S. Embassy in Port-au-Prince, Haiti. The students, in Haiti during January as part of a Global Justice campaign, were on their way to the embassy for a meeting. When the van they were riding in arrived outside of the embassy, the students scrambled to get inside and away from the violence. All the U.S. students were let in, Tran said, but the embassy security guard did not allow their driver to enter because he was Haitian. The students felt torn between going inside for safety and staying with their driver, Tran said, because they had become close friends with him during their trip. The students ultimately chose the safety of the embassy, but Tran said she feels that this experience reflects the overall current relationship between the U.S. government and Haiti. The U.S. government is denying Haitian people aid in a time of extreme need, Tran said. While the country is embroiled in rebellion, the U.S. government continues to enforce their aid embargo in Haiti. Haiti has the highest mortality rate in the northern hemisphere and their AIDS infection rate has reached 6 percent. In the United States the AIDS infection rate is 0.6 percent. Also 80 percent of Haiti's population lives below the poverty line compared to 12.7 percent in the United States. Haiti may seem like a long way from Dakota County, where Tran grew up and lives with her parents Xia Tran and Khen Ma in Lakeville, but her experiences in Rosemount and Lakeville led her to where she is today. Tran got her first taste of leadership at Rosemount Middle School as a member of their student council. After her time on the student council, Tran said, she realized that if she could be a leader in her school, she could also be a leader in her community. At Rosemount High School, Tran said she participated "in a ridiculous amount of activities. She was also very active in the community. One of Tran's positions was on the Dakota County Youth Planning Committee, an organization dedicated to promoting healthy lifestyles and options for youth. As co-chair Tran said she tried her best to demonstrate to other youth how they could create healthier lifestyles. Tran said she thought it was especially important to give other young people tangible ways to make improvements in their lives and communities instead of just sitting around and talking about it in a meeting. Tran would carry this philosophy with her on her trip to Haiti. Tran also became involved with Target Market, helping to found the youth anti-smoking campaign. In her work with Target Market, Tran said she was able to get out and talk to a lot of youths in the community, something she likes to do. After graduating from Rosemount in 2002. Tran began attending the College of St. Scholastica in Duluth. At St. Scholastica, Tran is working on designing her own major that will probably include political science, philosophy, and Latin American studies. While Tran was at school, a friend from Target Market told her about Global Justice. internationally to promote global justice and responsibility through transformative education, leadership development, informed advocacy and better public relations. Global Justice currently is pursuing two different campaigns, the Student Global AIDS Campaign and the Student Campaign for Child Survival. Both of these campaigns were relevant when Global Justice traveled to Haiti in January. Haiti has been in political turmoil for decades. In 2001 the United States began an aid embargo on the country because of a disputed election. Since then, the United States does not think the Haitian government is stable enough to receive funds, Tran said. The group traveled to Haiti to experience what life was like and to build relationships that would help them with their campaigns. During their trip, Tran and the group talked with Haitian citizens, visited clinics, and attended many meetings. Since returning from their trip, Tran and the other students have tried to increase awareness about the poverty and AIDS situation in Haiti.Ý So far, Tran said she has done this by sharing her stories with her friends and family and holding a teach-in at St. Scholastica about the subject. The Death of Haitian Democracy from Diane Tran on Vimeo. Happy New Year, everyone! I'm excited for @MinnesotaRising to have our second vlog interview with Brian Bell, a Millennial leader role modeling active citizenship in Minnesota! Please check it out and share your feedback below. @MinnesotaRising Meets: Brian Bell from Diane Tran on Vimeo. Favorite thing about Minnesota or being Minnesotan: "If I had to pick one favorite thing about Minnesota it’s the State’s culture. I love Minnesotan’s friendliness and value of education, the arts and environment. I also appreciate how civically engaged Minnesotan’s are. If I could pick two things, I’d also pick the changing of the seasons." 1:54 | Tell us about how you first got civically engaged and why you're so interested in these things here in Minnesota. "I was the type of student in high school that really, I did everything - by the end of high school, they had to not select me for things. When I got more civically engaged was when I moved back to Minnesota and got involved with the Citizens League. Currently, at my job at the State Bar Association as the Civic Education Manager, I teach people or help people become engaged in government and civics. Since I've moved to this job, I've continued my work with the Citizens League and other boards I serve on, including the Minnesota Council for the Social Studies. The seeds of it were certainly in high school and then I just continue to serve today." 3:24 | You and I recently finished teaching the first cohort of the Quantum Civics course. I'm curious what your take is on what your previous experiences have given you and enlightened you on to be able to teach that course to other people interested in active citizenship? "In large part, my experience with the Citizens League really prepared me for that. As we're both aware, it wasn't really our years of civic leadership that prepared us to teach that class. We really facilitated the learning with the students and my understanding of the values that we taught in that class from my work at the Citizens League: democracy, engagement of stakeholders, transparency, and public accountability and really practicing those skills while at the Citizens League most helped prepare me for that work." 4:36 | In speaking of preparation and how one gets positioned for this type of work, one thing that's interesting is that your father is quite a leader also in the Twin Cities area, in the civic realm. How has that influenced you, if at all? "It would probably be difficult to overstate the influence that my father has had in my getting involved in civics and engaging my community. It's certainly an innate part of who I am - I'm not the type of person who likes to sit around and watch television - and I think I inherited that from him. I saw him, while I was growing up, not necessarily be a leader in one particular job, but how he jumped around in his career to do different things, as I think I have, and his board service and seeing him really be involved in the United Way Board, the Hennepin Trust board; he was just really engaged in politics and more generally, the civic arena. So rather than talk about sports around the dinner table, we talked about politics and current events from a young age, and that's what really sparked my interest." Note: Brian's father is Peter Bell, Chairman of the Metropolitan Council. 6:22 | Some of your work in the Citizens League has revolved around young people and emerging leadership. For those watching who are curious, could you share about opportunities with the Citizens League happening for young people? "I'm proud the Citizens League had made its organization much younger. It was sort of seen as a paternalistic, old white male organization and they've really transformed it, under the leadership of Sean Kershaw, into a very young, vibrant organization. They met young people on their terms and created programs that were appealing to young people - like the Quantum Civics program - and Policy and a Pint. They partner with a radio station that appeals to young people - the Current, they host it on a college campus in a bar/beer hall, and they talk about subjects in a manner that is relevant to young folks. They haven't just invited them to their old boys club, they've really made programs that are appealing to young folks." 7:57 | What do you think it is that draws you towards working with this younger age group and being such a champion for your own peer group? "I think the Baby Boomer generation crowds out the other generations and in some respects, have eaten our seed corn and we're going to have to pay for their overindulgences. It's the responsibility of people in our generation to correct some of those wrongs. I think we're going to have to do reforms, civically and politically, in how we operate and spend. It's going to be the responsibility of the Millennials to reform those institutions. That's one of the reasons I'm compelled to work with my peers and other than that, I enjoy hanging out with them." 9:51 | What is one of your greatest accomplishments thus far in your young life? "One is running a 4:35 mile in high school as an avid distance runner. The other is my work at the Minnesota State Bar Association. The program I inherited was relatively young when I came on board and I was first full paid staff to work on that program. It's really grown into a pretty robust program and adds a lot of value to the community." 11:07 | Anything else you want to share with folks who are watching? "Organizations like the State Bar Association, like the Citizens League and some of the boards I serve on, have really invested a lot in me and trusted me. I feel a moral obligation and imperative to contribute back and pay it forward. I think we're all indebted to that. The act of being of service that goes with being involved in your community reaps much greater benefits in the self-forgetting, contacts, and resume-builders than I contribute. I would encourage people, wherever it is that invest time, work, or volunteer, or whatever it is, to find what is their capacity, what's their role to be of service? Not everybody's is the same, and not everybody has the same capacities and capabilities, but I think that they'll find they'll get a lot more in return." Offering free classes open to everyone, the Experimental Collge of the Twin Cities or EXCOTC is dedicated to transforming education on the principle that everyone can teach or take classes and all classes are free. As an all volunteer run organization EXCO is no bigger than those who participate. "When you act, EXCO grows," so visit their website or Twitter and sign up to take a class, facilitate a class, or attend one of their upcoming events! Spring Class applications are due Monday January 18th. Open Culture's website touts that it has the best cultural and educational media on the web. They've compiled a list of 250 free online courses from the world's leading universities. The collection includes audio and video courses in the liberal arts and sciences available for download straight to your computer or mp3 player. For more, check the end of their listing, which includes a few additional resources for General Open Course Collections, including YouTubeEDU. In the spirit of bringing holiday cheer as far as into this new year as possible, I wanted to highlight a group whose local volunteers I have recently learned from and lobbied with on climate action issues. The Audubon Society wraps up its 110th Christmas Bird Count today, demonstrating that despite the over-professionalization and specialization of technical roles, ordinary citizens are still empowered to use their everyday skills and local knowledge for the common good. It's not just for the birds. 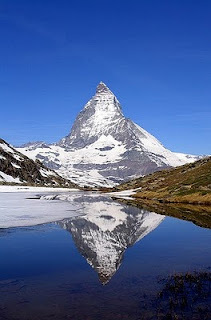 From December 14, 2009 through January 5, 2010, tens of thousands of volunteers throughout the Americas took part in an adventure that has become a family tradition among generations. Families and students, birders and scientists, armed with binoculars, bird guides and checklists go out on an annual mission - often before dawn. For over one hundred years, citizen scientists have braved snow, wind, and rain to take part in the Christmas Bird Count, making an enormous contribution to conservation. Audubon and other organizations use data collected in this longest-running wildlife census to assess the health of bird populations and to guide conservation action. From feeder-watchers and field observers to count compilers and regional editors, everyone who takes part in the Christmas Bird Count does it for love of birds, the excitement of friendly competition, and with the knowledge that their efforts are making a difference for science and bird conservation. To learn more about what the birds are telling us about climate change, see the latest report, "Birds and Climate Change: Ecological Disruption in Motion."